It is with much excitement that I share these images of the 'United We Stand' campaign, created in partnership between Mount Franklin and Samantha Wills, in support of the McGrath Foundation, who work tirelessly to raise funds that are used to employ Breast Care Nurses around Australia. 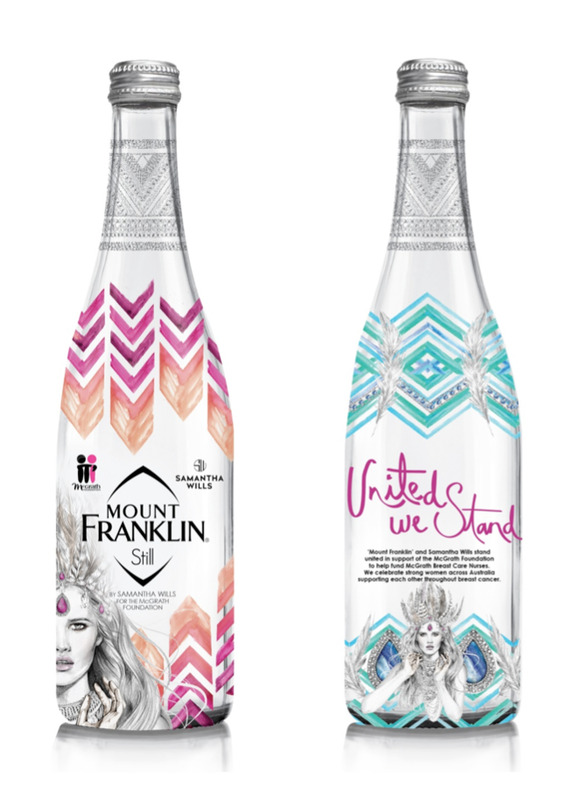 Running throughout September and October to coincide with Breast Cancer Awareness Month, the campaign includes specially designed Mount Franklin products along with a limited edition t-shirt, available from samanthawills.com, from which $30 of each sale goes directly to the McGrath Foundation. I am so honoured to have been asked by Samantha once again to bring her amazing creative vision for these bottles to life, and even more so to be a part of such an important and empowering campaign. "United We Stand" draws its inspiration from Jane McGrath herself, and the foundation's motto that "Together We Can Make a Difference." Samantha's vision was for an illustrated Warrioress that embodied the strength of femininity, and the power that our relationships have to build us up and support us in times of need. Through the sale of these products, and the spread of this message, we, united, can all do our part to help and, in turn, raise awareness for regular breast checks. You can find much more information on the Samantha Wills website here, where she will be posting regularly about all of the supporting products available, including a special limited-edition jewellery range. Again, I am so proud to be involved in this beautiful partnership and even more so to help spread the message in any way that I can. So buy a specially marked bottle, drink up, and keep checking those breasts! While you're at it - get yourself a tee, some jewels and support the campaign in style. Image credit: B+W campaign photograph by Scott Ehler.